I had the best shrimp ever in Cancun last year. Across from our resort was a pretty little restaurant in a straw hut overtop the ocean. To celebrate our last night in Mexico, we had dinner there. It had no windows so the breeze was blowing in on us, the moon was shining on the ocean and our server introduced himself as the “Mexican Danny DeVito”. This made for a memorable (and hilarious) evening. I have always been indecisive and the menu was full of incredible choices but I knew I wanted seafood. When I asked the Mexican Danny DeVito (who really did look exactly like him) what I should order between my top two choices, he recommended the Bacon Wrapped Shrimp. Um, why was I even considering anything else in the first place? When our meals came, I was shocked. The shrimp were HUGE. Like, almost as big as the palm of my hand. When I tasted them, I almost died. Granted, I have never had anything but frozen Saskatchewan grocery store shrimp, but I couldn’t even speak after tasting these. They were so fresh tasting, slightly sweet and wrapped in a slice of perfectly cooked bacon. I have been thinking about them literally for a year and made some this past Christmas for an appetizer. While they weren’t exactly ocean fresh, they were still awesome and everyone raved about them. I had made a ton and was trying to think of an interesting spin on the few leftovers. Craving greens from all of that Christmas indulgence, I threw together this dish. 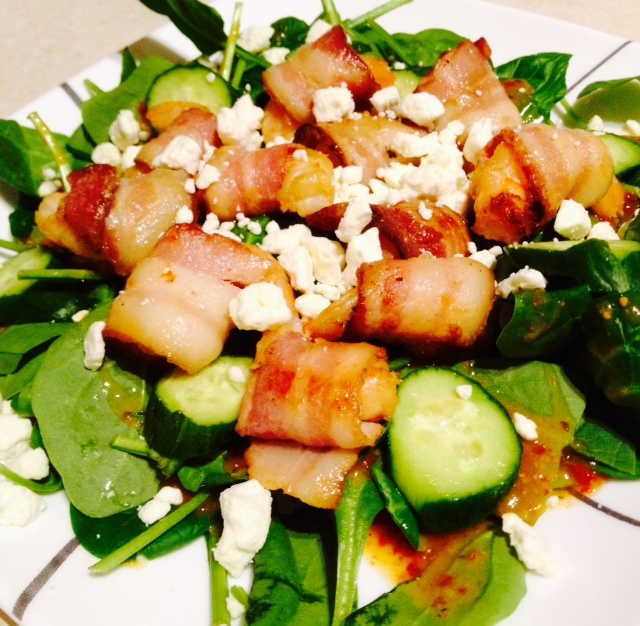 It still feels like a treat with the bacon and feta but a little lighter with the freshness of a salad. Everything you could want in a meal. I bet even the Mexican Danny DeVito would approve. Toss shrimp in a large Ziploc bag with soy sauce, brown sugar and garlic. Marinade for at least 30 minutes. When ready to cook the shrimp, preheat oven to 400 degrees. Cut bacon slices in thirds. Wrap each 1/3 slice around a shrimp and secure with a toothpick. Bake for 10-15 minutes, watching closely, until bacon is crisp. Once cooled a bit, remove the toothpicks and cut each shrimp in half if desired. To assemble salads, lay two cups of spinach down on each plate, then divide the cucumber and red onion evenly on each. Divide the shrimp in half on each salad and spread the feta evenly on top. Drizzle with your desired dressing and serve!